UPDATED: Thu., Aug. 31, 2017, 8:04 p.m.
ROCKPORT, Texas – Donning blue work gloves and dispensing hugs, Vice President Mike Pence cleared storm debris and comforted Texans grappling with the aftermath of Harvey’s destruction on Thursday, bringing a more personal touch to the hurricane zone than President Donald Trump did during his visit two days earlier. 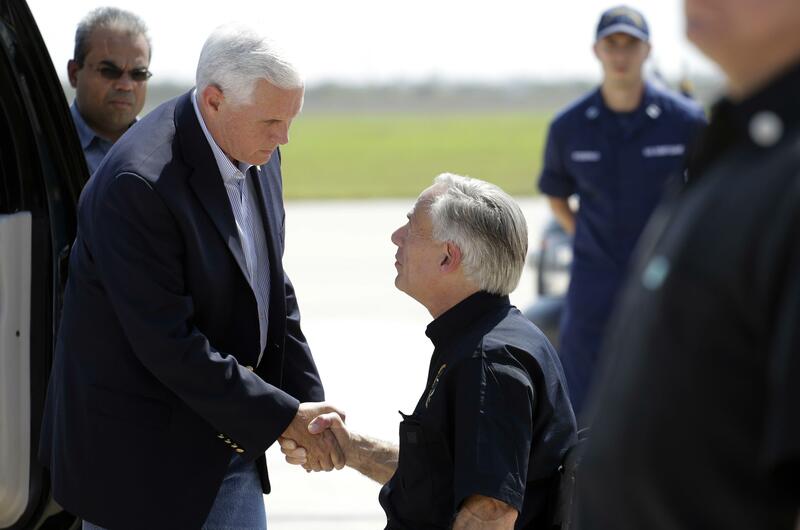 Sleeves rolled up, Pence briefly walked door-to-door in Rockport, a small tourist town where Harvey first slammed ashore as a Category 4 hurricane. The extent of the ruin could be measured in the mounds of black garbage bags heaped outside nearly every home, and Pence – wearing jeans and cowboy boots – worked up a sweat in the 90-degree heat as he helped clear tree limbs at one boarded-up residence. Trump, however, saw little damage during his visit to Corpus Christi – mostly boarded-up windows, a few downed tree limbs and fences askew. He also visited the state emergency management operations center in Austin. Published: Aug. 31, 2017, 10:54 a.m. Updated: Aug. 31, 2017, 8:04 p.m.